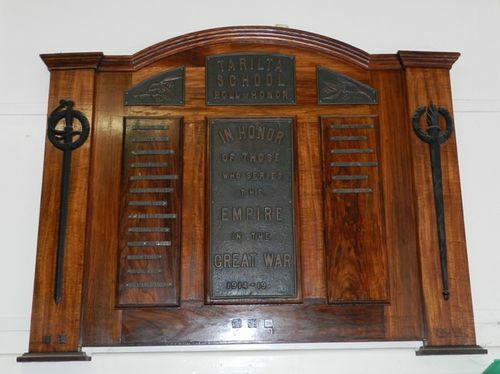 The honour roll of the now non-existent Tarilta State School commemorates scholars who served in World War One. All of the men on the honour roll were wards of the state as children and lived in orphanages in Melbourne. They were adopted out to farmers in the Tarilta area and then "employed" as indentured farm workers, which basically was child slave labour. The only escape from their servitude after they turned 18 was to enlist for service in World War One. An unusual aspect of this honour roll is that all those listed on the roll, are listed by firstname and surname. The Honour Roll was unveiled by the Premier of Victoria, Mr. H. Lawson, on Saturday 9th November 1918. The little township of Tarilta was crowded with visitors on Saturday afternoon, the occasion being the unveiling of the honor roll and photographs at the local State school included among the visitors being the Premier (Hon. H. S. W. Lawson), the Hon. A. Hicks, M.L.C., and the president of the shire (Cr. Arkinstall) also Cr. Rowe, of Castlemaine, and prominent residents of Guildford and district. Cr. Arkinstall presided. The proceedings opened with the singing of the National Anthem. The chairman eulogised the men who had gone to the front, and hoped when they returned they would be treated fairly by the Government, and light positions found for wounded men. The Premier, in unveiling the handsome honor roll, spoke highly of the work done by the Australians at the front, pointing out how they saved the situation on more than one occasion, and explained the great part Great Britain and each of the Allies had taken in the war. He said the repatriation of returned soldiers would receive from the Government and people very earnest consideration and sympathy. Castlemaine Mail (Vic), 14 November 1918.